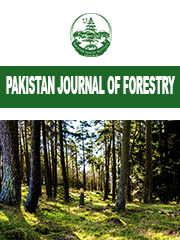 The Pakistan Journal of Forestry a Biannual Journal of Forestry and allied Subjects. The Pakistan Journal of Forestry is a professional biannual publication. Subscription rates (payable in advance by crossed Postal Order/Crossed Bank Draft/Crossed Cheque, but no MONEY ORDER please). All payments are non-refundable. ADVERTISEMENT RATES (Annual) Excluding designing and block making. Opinions expressed by contributors in their papers are entirely their own and are not necessarily shared by the Editor or the Government. However, the Editor reserves the right to withhold publication of submitted papers or to make excisions or condense articles before publication. All communications must be authenticated by the name and the address of the writer being communicated to the Editor whether intended for publication or not. Usual conventions of the Journal have been printed on the inside back cover of each issue for the guidance of authors. No payment will be made for articles which are accepted for publication in PJF. Change of address should be communicated promptly.